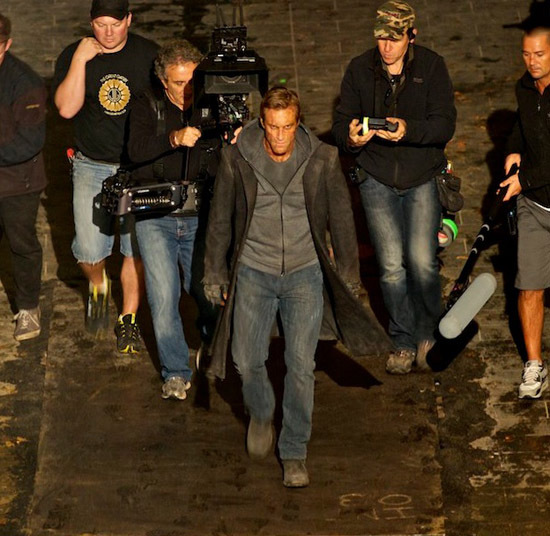 The First Look at Aaron Eckhart on the Set of the Stuart Beattie's 'I, FRANKENSTEIN'! An image had emerged online giving us our first look at Aaron Eckhart on the set of the Stuart Beattie's I, Frankenstein. The movie, based on Kevin Grevioux's comic book is also 'channeling' into Mary Shelley's original novel as inspiration for the story. Bill Nighy, Yvonne Strahovski & Mirando Otto also star. The story is a gothic, modern-day fantasy thriller that tells the story of the original monster of Victor Frankenstein, who stands between the human race & an uprising of supernatural creatures determined to overthrow the world. I'm reading: The First Look at Aaron Eckhart on the Set of the Stuart Beattie's 'I, FRANKENSTEIN'!Tweet this!